In the hey-day of the big working cats, scandalizing was a standard catboat sailing skill that has been almost totally forgotten today. This is unfortunate because scandalizing is a very handy, simple-to learn technique, and I’ll bet there isn’t a Beetle cat sailor alive who couldn’t have avoided some hair-raising heavy weather experience if he or she had know how to do it. So what is this mysterious technique? Simply put, scandalizing is fast, easy way of temporarily reducing the working area of a gaff rigged sail by setting up the topping lift (a line rigged like a halyard to support the end of the boom and slacking away on the peak halyard to lower the gaff and upper half of the sail. The remaining triangular section of sail represents about half the original area, and the whole operation takes only a few seconds to accomplish. Luckily, tightening the topping lift can be omitted when scandalizing a Beetle Cat since the boom is adequately supported by the sail, and most Beetles aren’t filled with lifts anyway. 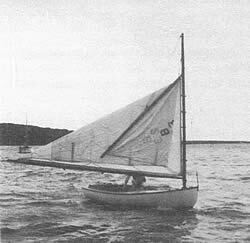 The small “trisail” left with a scandalized rig is surprisingly efficient and, although this rig works best when sailing off the wind, the boat handles remarkably well on any point of sail. Scandalizing is, however, only a temporary measure and not a substitute for reefing. In fact, prolonged scandalizing will eventually ruin the shape of your sail. So, if you are going out for a sail on a blustery day, plan on reefing before you leave the mooring. On the other had, if you get caught in a sudden squall and want to make a quick run for shelter, scandalizing is just the thing. As you know, the Beetle Cat is, for the most part, a good, stable, safe boat for children. However, children are also much more quickly overpowered by a Beetle Cat as the wind starts to come up than they would be in a sloop-rigged dinghy of equivalent sail area. For this reason, scandalizing is a “survival” skill that should be taught to all children. Kids who know how to scandalize will be more confident in their ability to cope with a boat that suddenly becomes unruly, and their parents can worry less about letting them go out sailing on their own. Sailing instructors will also find classes of kids trained to scandalize a real blessing when dealing with a group of Beetles in an emergency. Keep the centerboard all the way down. Lower the gaff (with the peak halyard only) to the leeward side of the sail. Set the peak halyard so that it is just tight enough to support the weight of the gaff. So, the next time you are out sailing, give scandalizing a try-you have nothing to lose-and, on some wild and windy occasion in the future, you may well be glad you did. 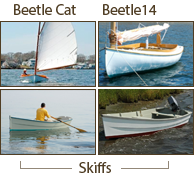 This article first appeared in the 1985 Yearbook of the New England Beetle Cat Boat Association and has been slightly edited and updated as it appears here.